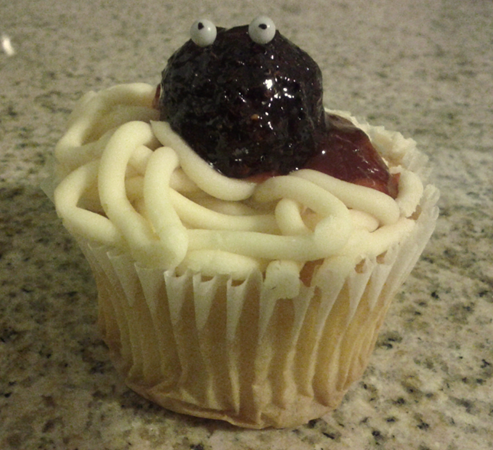 I wanted to share a picture of this FSM cupcake my sister gave to me. "He that eateth my noodle, and drinketh my marinara, dwelleth in me, and I in him." that chap was quite angry wasn`t he. think he had rather overdone the vermicelli somewhat. Only thing is, as far as I can see the representation has only one (1) meat *ahum* ball. Now personally I am an even balance girl but still open minded. But wouldn’t this normally be the time and place a religion absolutely HAS to split up in splinter groups, the conservative two-ballers, the militant one-ballers and the alternative who-cares-three-or-more-ballers and I daren’t imagine the noodly formations nihilistic none-ballers might bring forward. To ward away the chimerean future of more than 2000 fractions – like some religious fishing clubs we all know have resulted in – we should hereby declare the right to ballistic freedom for all pastafarians.